Duluth, GA, June 25, 2009 – Lotus Cars USA, Inc. is pleased to announce that Lotus will be the Title Sponsor of the growing Lotus Challenge Series. The Lotus Challenge Series was begun in 2008 by long-time Lotus enthusiast Jim Navarro along with critical support from other Lotus aficionados Jack Fried and Robb Bonanno. To help expand the Lotus Challenge Series to the east and continually improve the series, Jim recently took on a fellow racer as a partner in the series – Tom Hughes. The inaugural year of the Lotus Challenge Series in 2008 was comprised of eight events with six at various California tracks and two events at Spring Mountain Motorsports Ranch in Pahrump, Nevada. The first year of the series was a great success with full grids and a lot of fun and camaraderie enjoyed by all the Lotus racing participants. With a good, solid first full year of learning and experience under their belt, the Lotus Challenge Series has been expanded for the 2009 season to 10 western US events (see included schedule), initially, and is now in the process of expanding further with an additional 4 events being planned for Lotus owners to enjoy in Texas. As the race schedule is expanding for the series, the variety of the venues is as well with upcoming events scheduled at the revered Laguna Seca Raceway in Monterey and famous Infineon Raceway in Sonoma. 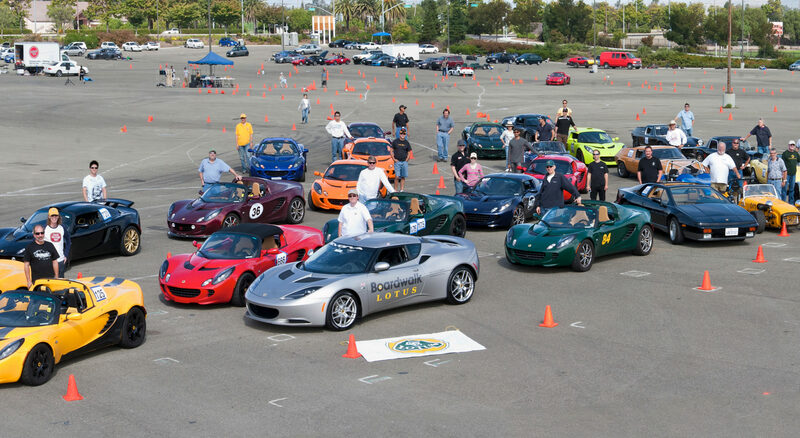 The full array of Lotus’ current North American product offering competes in the Lotus Challenge Series including various Elise and Exige models and the track-only Exige Cup Car 255 and the current ultimate track-only Lotus 2-Eleven. As the Lotus Challenge Series continues to grow in participation and expand into other parts of the country, the dates and details for new events in the south and on the east coast for 2010 will be announced in August 2009. Registration is set to up open first thing tomorrow (June 18) for the July 18th, Saturday points event #3 (of 6) autocross. The usual drill. Club members only can sign up in the first week, then it opens up to everyone. Limited car count and at least 12 runs for everyone with lunch being brought on site. Coaches available for pretty much every session to help out if needed / wanted. Running in the points series is not required, you can simply treat this as a excuse to take your car out for a *spin*. Registration is now open for the Golden Gate Lotus Club’s second open track day of the year at Thunderhill Raceway Park in Willows, California. This event will be held Tuesday, July 14, 2009. Schedule your PTO, sick day, or whatever you want to call it, and come out and enjoy the fun. Take note that for this event, we will be running the bypass. Start prepping your cars and we’ll see you at the track! The Norfolk-based Litespeed Formula 3 team has announced plans to enter the 2010 Formula 1 season under the iconic Team Lotus name. The founders of Litespeed, Nino Judge and Steve Kenchington are both former Lotus engineers, and have received permission from Lotus name rights-holder David Hunt to use the evocative title for their F1 bid. Former Team Lotus driver Johnny Herbert has joined the team as driver manager and commercial ambassador.